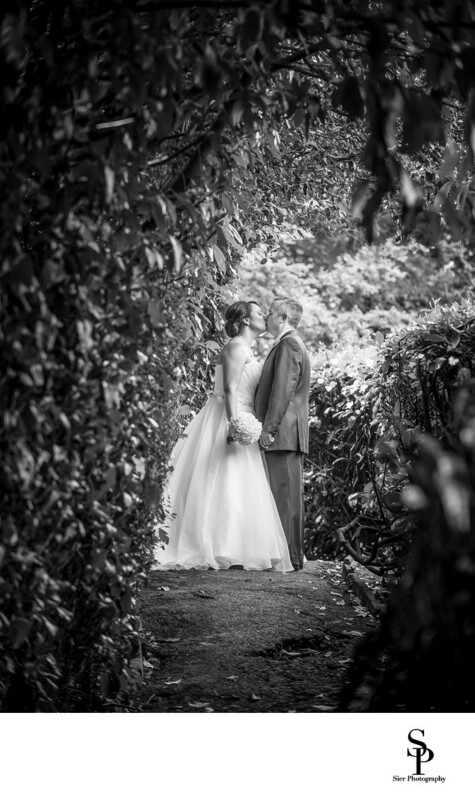 Wedding photography in the grounds of Kenwood Hall Hotel in Sheffield. The bride and groom steel a kiss under the secluded tree-lined path at this wonderful suburban Sheffield wedding venue. Every time we photograph at the Kenwood we find another little area or somewhere new to explore, one that we haven't seen before, or at least it seems that way. We have been lucky enough to photograph dozens of weddings at Kenwood Hall and each and every time we find somewhere new to explore around the wonderful 12 acres of grounds. This image is presented here in black and white as it adds a little to the mood of the picture but at the same time it doesn't benefit from one of the best aspects of Kenwood Hall, the luscious and vibrant colours of the fantastic gardens. And it doesn't seem to matter what time of year it is, there is always something colourful to see even if it is poking through the snow! We love to undertake our photography work here and it is all the more special when we have a wonderful couple to work with like Rhian and Mark. We had a wonderful time wonderful time with them and thier boys as well as the rest of their family and friends.